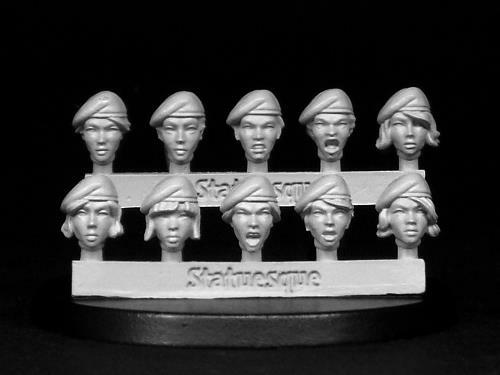 The Heroic Scale Female Heads - Berets set, featuring fetching military-style berets, is designed to allow you to convert your heroic scale miniatures. 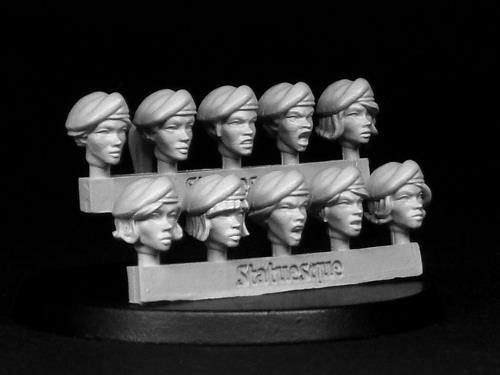 Whereas the SMA351-357 Heroic Scale NARROW range is great for converting heroic scale female figures or more slight heroic scale figures in general, the Heroic Scale Female Heads - Berets set is designed specifically for converting heroic scale male figures, such as heavily armoured space knights or troopers in fatigues and body armour. 10 metal female heads wearing berets. The SMA303 Heroic Scale Female Head - Berets set is priced at £4.85. Purchase 2 or 3 SMA303 sets for £4.60 per set.